Donald Trump tweeted about the "electricity" backstage as he prepared to host "Saturday Night Live," but outside the NBC studio more than 100 people protested his appearance on the show. Trump, a leading Republican presidential candidate, will be taking the stage amid lingering controversy over his comments in August that many Mexican immigrants were criminals and rapists. Hispanic groups had asked 'SNL' to revoke the invite and a Latino group has offered a $5,000 "bounty" to anyone in the audience who will disrupt the show. "SNL" and the network have remained mum. Outside 30 Rock Saturday evening between 100 to 150 protesters chanted, "How do you spell racist? S-N-L."
Inside, Trump appeared unfazed and was tweeting a preview of the show. I am at the Saturday Night Live Studio - electricity all over the place. We will be doing a "tweeting" skit, so stay tuned! Earlier in the day, Trump was busy tweeting about his hosting gig. 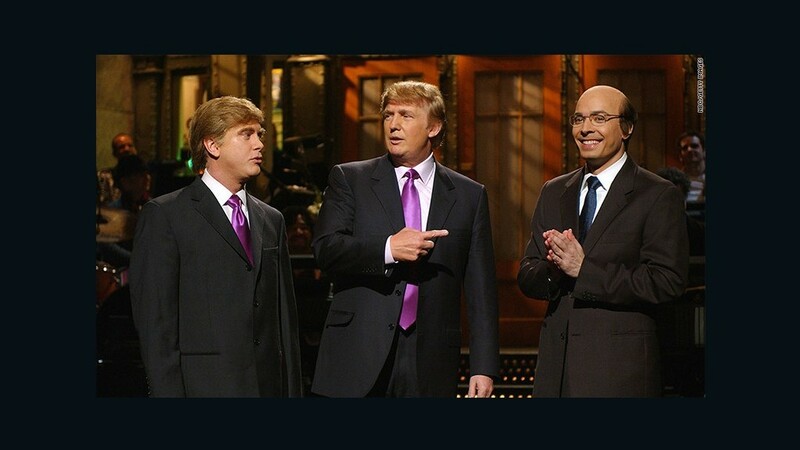 "Saturday Night Live has some incredible things in store tonight," Trump tweeted Saturday. "The great thing about playing myself is that it will be authentic! Enjoy." The candidate also tweeted photos from backstage, including one on Friday of himself wearing a giant wig while standing next to the show's musical guest Sia. NBC has kept a tight lid on the show's preparation all week, so what can audiences expect from "SNL" and Trump on Saturday night? According to CNN contributor Bill Carter, who has written two books about late-night TV, the show may speak to the issues surrounding Trump's appearance. "'SNL' is all about commenting on and satirizing contemporary culture. They won't shirk that in this case with all the scrutiny on the show," Carter said. "I expect a mix of sketches that play off his image and controversial stands along with the broader comedy the show usually does." "SNL" is one of America's greatest comedic stages, as well as one of its most important satirical institutions. As for Trump, the Republican presidential candidate has been the face of the early 2016 election but has courted controversy along the way. Beyond the protests and criticisms, Trump's involvement is also garnering a lot of attention from viewers who are waiting to see just how "SNL" and Trump will interact. Trump, who hosted the show in 2004, said in an interview with Bill O'Reilly on Friday night that he had to cut some sketches. "There were a couple that were too risqué," Trump told O'Reilly. "Because you know, the poll just came down, I'm leading in Iowa, I want to stay leading in Iowa." As for the skits that made the final cut, Trump said: "I think some of it is going to be really great."